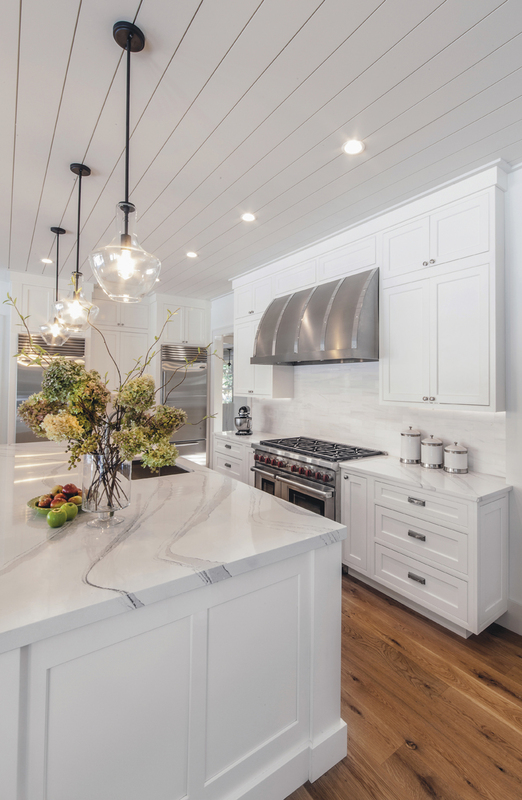 Lakeville Kitchen and Bath’s designer, Katheen Fredrich, teamed up with renowned builder Prendergast Development, Inc., to create a comfortable and warm, modern farmhouse kitchen in Sag Harbor, NY. The task was to design a clean and fresh looking kitchen with versatile appeal that would satisfy any buyer. Medallion’s Platinum Line was the cabinetry of choice. The Santa Cruz, flush inset door in White Icing paint kept that classic feel, but the design of a clean ceiling and base molding detail added to the modern aesthetic. The stacked cabinetry reaches a beautiful 9 1/2-foot beadboard ceiling. Impressive stainless steel appliances contrast with the soft white cabinetry while the natural, wide plank white oak flooring adds warmth to the overall space. by Cambria, subtle marble backsplash tiles and hardware in a pewter finish.